Although born in Southern Vietnam, Chef Michael Chuong fled at age 15, escaping Communist Vietnam. With seven ounces of gold, his family purchased his seat on a boat traveling to the South Seas. Months later, he arrived in New Orleans, Louisiana, via a refugee camp in Singapore. During those first years on American soil, he longed for the traditional Vietnamese food of his homeland. Just a few years later he would embrace classic French and American cuisine as he did with Vietnamese food as a child. By adulthood, Chuong would become known for marrying his native Southeast Asian cuisine with Western and European cuisines as expertly as if they were all his own. As the eldest son, Chuong’s most vivid memories of his youth take place in the kitchen with his mother, preparing for each night’s family meal. Well-versed in the art of cuisine, his mother studied cooking in preparation for her marriage to his father. So, traditional Vietnamese and Chinese cooking, artfully presented, was de rigueur at the Chuong family table. Her culinary knowledge and semi-professional finesse captivated Chuong as a boy and continues to today. Pungent curried crabs and aromatic Braised Five Spice Pork Shank left an imprint on his food memory and will play a starring role on his menu at the soon-to-open elements. After arriving in the United States, Chuong learned the English language and the ways of Americans while attending high school in New Orleans, and later at Louisiana State University where he studied for his dream career in architectural design. But what began as a part-time job at the four-star Inter-Continental Hotel of New Orleans soon took hold as his new dream career. 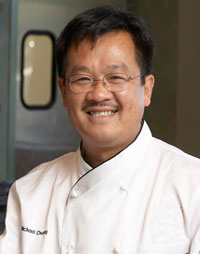 Recognized for his advanced palate, finesse in the kitchen like his mother, and curiosity in the culinary arts, Chuong was trained extensively and eventually promoted throughout the kitchen to the position of Chef de Cuisine at the Inter-Continental Hotel’s five-star restaurant, Le Continent. Throughout these seven years, he competed in the American Culinary Federation winning medals in GoldSilver, and Best of Show, and was honored to be the guest chef of the Inter-Continental Hotels of Hawaii and Colombia. These years sharpened Chuong’s skills in classic American and French cooking and in the art of fine dining. In 1992, when asked by his colleague to join him as his partner and chef in opening Delargo, Chuong seized the opportunity, knowing it would provide him with excellent training for his own future restaurant. There, he designed a classic French-American menu, learned to operate and manage a new restaurant, attend to guests’ needs, and grow a new luxury business. In a few short months, the New Orleans’s Time-Picayune awarded Delargo four stars. By 1993, Chuong’s reputation as one of New Orleans’ best chefs was no secret. The four-star Fairmont Hotel recruited him to reinvigorate their highest-end dining room, Zazerac. After one year, Chuong succeeded in elevating their status to one of the top 25 restaurants in New Orleans and again received four stars for his exemplary efforts. With such accomplishments under his toque, Chuong accepted the role as Executive Chef and Operations Manager at New Orleans’s City Energy Club in 1995. Management of multiple kitchens and dining rooms, with expectations of raising profit margins and reducing labor and food costs, proved to be Chuong’s biggest challenge yet, and after 2 years, Chuong considered offers to open The City Energy Club in Singapore and Hanoi. With a growing family of four young daughters, Chuong declined and instead accepted the position as Executive Chef at the privately owned Prestonwood Country Club in Cary, NC, in 1997. Chuong’s reputation once again preceded him – not only for his mastery of four-star classic French-American cooking, but also for his keen ability to update American fine dining with his signature Eastern approach. Ann Goodnight of Prestonwood Country Club recognized Chuong’s unique talent and delighted in his ability to revive their fine dining setting with exotic flavors and Asian classics while presenting an exceptional American fine dining experience. Thanks to her vision and support, Chuong continued to educate himself as a chef, each year traveling to the Far East and apprenticing under prestigious chefs and native cooks alike – perfecting Thai curries at the Chiangmai Thai Cooking School, mastering clay cooking and other family-style dishes among native Vietnamese cooks and grandmothers, as well as studying the art of sushi at the acclaimed Sushi Academy in California under a Japanese Master Sushi Chef. After 8 years as the beloved Executive Chef at Prestonwood Country Club, Goodnight bestowed on Chuong his biggest honor yet – to partner with her in opening his own restaurant. ăn, which opened in late Summer 2006, represented the culmination of Chuong’s talent, heritage, and culinary experience, introducing a Southeast Asian-inspired restaurant like no other to the region. Here, Chuong’s life story unfolds at the table, through his version of “New World” cuisine. Successfully opening and operating ăn for over 6 years, Chuong has won multiple awards and made ăn into a Triangle destination dining spot. Elements, opening in 2012, will be his own concept and next challenge. Elements has been customized to the locals’ palates and will feature more dishes and flavors the community is looking for and craving. Chef Chuong has already created a large following, fostered goodwill in the community, and captured the attention and love of the Triangle. Copyright © 2019 Elements. All Rights Reserved. Please check out our Facebook page for updates on hours.